You can navigate to the business travel view from My Profile > Business Travel in the top right or select the Business travel option from the left menu. The business travel is a paid day where employees apply for work outside the office and may not punch for the day. Business travels require the manager's approval. To raise a business travel request. Enter your travel name and the dates that you are looking to travel. Next, select the travel template from the drop-down provided. 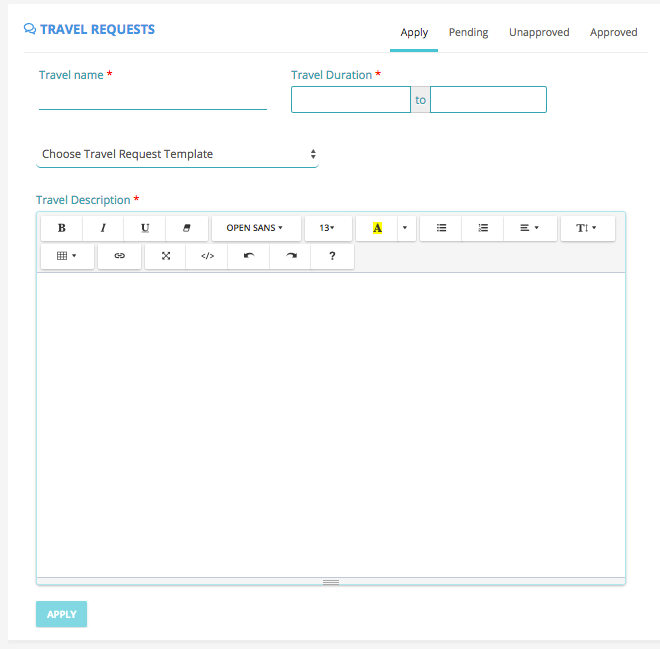 Know more about travel templates. Once the form is filled, click on save. You can see the status such as approved, pending and rejected for all your requests from the tabs on top. You will also see a notification badge that denotes the total number of pending business travel requests. Once approved you will be notified via email and web notifications.